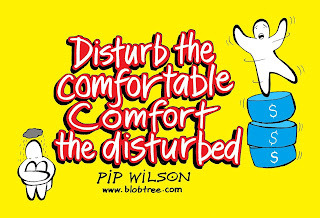 Pip Wilson bhp: Hi from a place called comfortable knowing that I need to refresh my irritation by stepping into a place called UNCOMFORTABLE. Hi from a place called comfortable knowing that I need to refresh my irritation by stepping into a place called UNCOMFORTABLE. We all like our comfort Zones. 'Comfortable' is a dangerous place to 'be'. 'Uncomfortable is a great place to 'become’. Socially - always staying with similar people like ourselves. Risk - we fail to take any risks - even for own development. Security - we seek security rather than freedom. We can just keep repeating what we have always done. Ask yourself - is this YOU? “….if only I had ….."
with the entry only accessible by you. but they are never weakness." Comfort is overrated. It doesn’t lead to happiness. It makes us lazy—and forgetful. It often leads to self-absorption, boredom, and discontent. Discomfort is a catalyst for growth. It makes us yearn for something more. It forces us to change, stretch, and adapt. Discomfort is a sign we’re making progress. You’ve heard the expression, “no pain, no gain.” It’s true! When you push yourself to grow, you will experience discomfort. I was driving home from a gig. based in the City of London. down the UK M1 motorway. I wrote blind onto this pad as I travelled home. Once home I had the following text to translate ….. I can’t give you advice. from my pace called imperfection. These are signals for growth. 'Uncomfortable is a great place to 'become'. Don’t die with your security intact. in a place called comfortable.